Humble Bellows: Be that bit of fluff El Libre? Vallo: That's the bit of fluff that's taking us to him. Once you suspend disbelief you can have a glorious time at this movie. 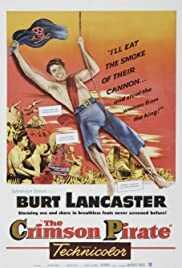 The Technicolor looks fabulous on DVD, Burt Lancaster is an Adonis if ever there were, and there's silly fun to spare all around, from the striped tights to the giddy pitched battles and doofus redcoats to the springy Cravat. You can easily see Spielberg and George Lucas learning their pacing and craft from this director, as well as outlandish stunts and fantastical conceits. You can't help but get caught up in it. Not only that, those two kisses shared by Burt 'n Eva are HOT. Yumm. For contrast, view Lancaster in Sweet Smell Of Success. Utter control.